We have this week been undertaking the cleaning, stripping and resealing of a quarry tiled floor. As can be seen from the before photo the tiles were in good condition but hadn’t been resealed since they were put down several years before. The result was that they were no longer protected from fluid and grease stains and were starting to look the worse for it. 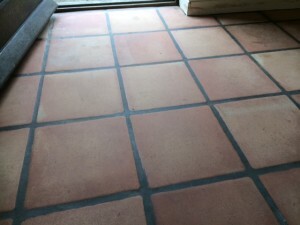 Most people assume that natural stone floors require no maintenance other than an occasional mop. The reality is that they should all have been sealed when they were laid and over time that seal will begin to wear so that it is no longer protecting the stone. 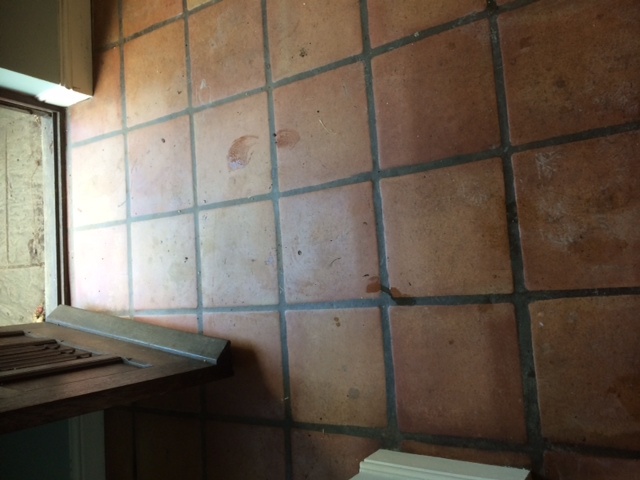 The effects of the sealer will last longer if the appropriate cleaner is used but at least once a year the floor should be thoroughly cleaned and a new coat of sealer be added, at least in the high traffic areas. By doing so your floor will continue to look great and not suffer from stains from whatever you spill on it. In this case the customer wanted a medium sheen finish, but either high gloss or a natural finish are also available. You can see from the during photo how the times looked in their stripped state before sealing. 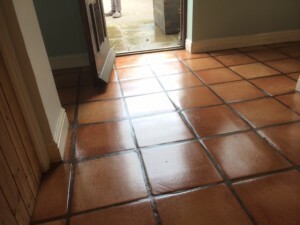 At The Rutland Cleaning Company we choose to use sealers from Nu-Life, some of the finest products available.